Today, the European Council on Tolerance and Reconciliation’s (ECTR) European Medal of Tolerance for 2018 was bestowed on HSH Prince Albert II of Monaco for his commitment to truth, tolerance and historical reconciliation. 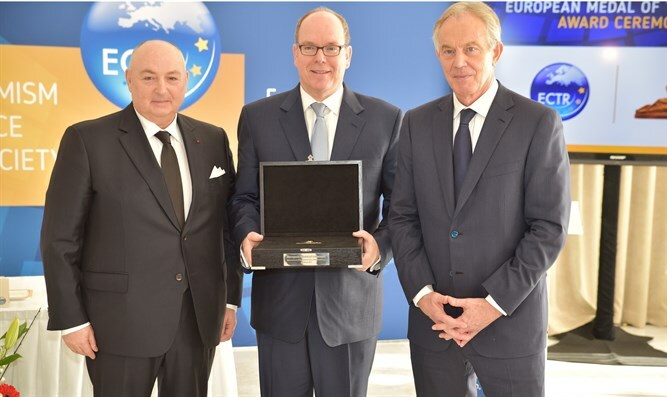 ECTR President Dr. Moshe Kantor and ECTR Chairman former UK Prime Minister Tony Blair presented the award to Prince Albert at the ECTR’s first roundtable held in Monte Carlo, to address the threat of radicalization and issues surrounding the challenges to tolerance in European societies. Heralding Prince Albert’s commitment to advancing a true account of the Holocaust, Dr. Kantor said his focus on historical accuracy supports “the best traditions of the Principality in tackling challenges of co-existence, respect and compassion”.